Our 2011 5.0L GT no longer runs on atmospheric pressure alone. 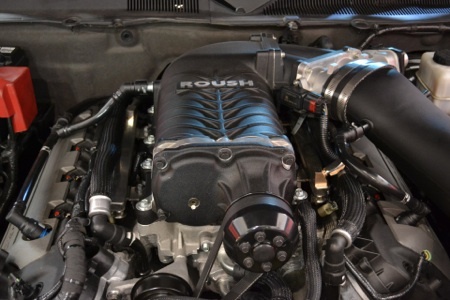 It is now seeing 12psi of boost supplied through an intercooled Roush TVS 2300 supercharger system. 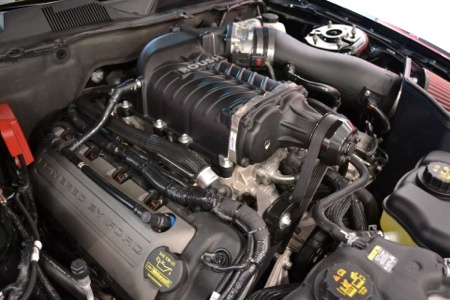 Because of the Coyote motors 11 to 1 compression ratio, the most common, and safest boost level for these is typically 7 to 8psi when burning unleaded premium fuels. But of course we’ve decided to take our own 2011 6-speed automatic car to a higher level to see what we can get on 93 octane, and basically a 5.0L GT that is just like what most people drive every day. No slicks and skinnies here, but a true 3980-lbs 2011 GT rolling on 20” wheels and drag radials in the rear. We left off with 12.0s at 115+ ¼ mile times while it was still naturally aspirated. But in 2012 when the decision was made to boost the car — We dropped if from 4.10 rear gears to 3.55’s because of how much harder the car would mid range with the TVS blower system. 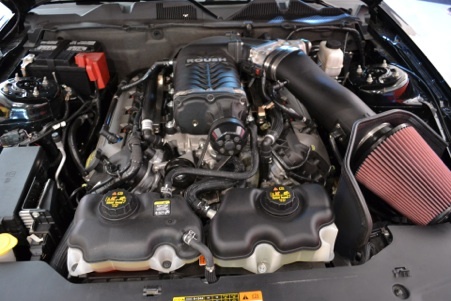 As of late 2012 we left off with 585 RWHP and 540 TQ. 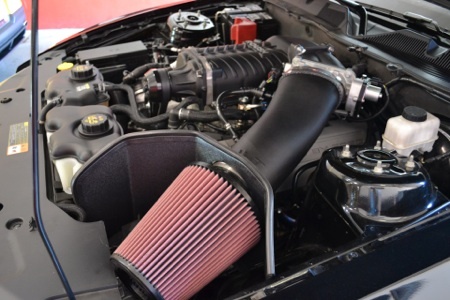 Other mods consist of 1-3/4” long tube headers with cat’s, resonators, and FlowMaster 3-chamber mufflers. We stayed for now with the default supplied 47lbs injectors, and a Voltage enhancing Boost-a-pump was installed after we raised the boost from 8psi to 12psi. Like all of Alternative Auto’s 2005+ shop owned Mustangs. Our 2011 also has zero suspension changes, and has still achieved some great whole shots and 60foot numbers on just a 20in drag radial tire. 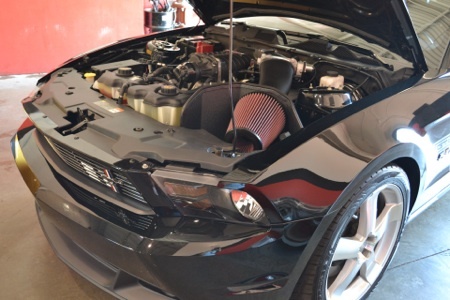 We’ve achieved what we feel is some seriously great results with a car that “once again” can simply be left in “drive” after the burnout, and lay down some great ET’s effortlessly in a full weight modern 2011 5.0L Mustang. Our best during the 2012 season with 20in drag radials and our new boosted combo resulted in 10.50s at 130+ mph with mid 1.5 60 foots. UPDATE TO OUR 2012 SEASON BEST! CLICK HERE FOR PICTURES, VIDEO, & TIME SLIP! 10.32 @ 132 mph with 1.49 60ft!